This book focuses on the risks that climate change poses for the health sector. It discusses the current vulnerabilities to climate-sensitive diseases, the resultant mortality and morbidity in human populations, the projected risks in connection with increasing global warming, and the options for tackling the adverse impacts of climate change. Adapting to climate change so as to effectively address the risks for and adverse impacts on the health sector requires an in-depth understanding of current deficits in health sector preparedness for climate-sensitive illnesses, as well as future plans and programs for increasing adaptive capacity and building resilience. 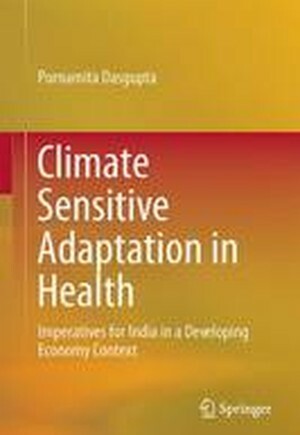 The book situates climate and health adaptation concerns in the broader context of developing countries, providing insights that can be useful for other countries as well, helping them further their health adaptation efforts. In India, poverty and inadequate access to basic water, health and sanitation services combine with climate-related events to adversely impact health outcomes. Introduction: Climate Risks in the Health Sector.- Climate Change Adaptation: The International Experience in Health.- Developing Economy Context for Adaptation Decision-Making.- Understanding Associations: Health, Socio-economic Wellbeing & Climate.- Analysing the Interface in Indian Plans and Policies.- Criticality of the Field: Three Case Studies.- Conclusion: Integrating Sustainable Development and Health Adaptation.